Who doesn't like a clean home? If you're new to this blog, I should tell you that my husband and I have been working to build a greener, more conscious lifestyle. Our "clean" lifestyle, if you will. Over the last five and a half years, we've been interested in nutrition, the environment, and animals, but my tipping point was reading The Kind Diet by Alicia Silverstone. Since then, we've made tiny changes here and there, and looking back, we've come a long way in the last eight months! ** You can add lemon juice or essential oils for a scented solution. 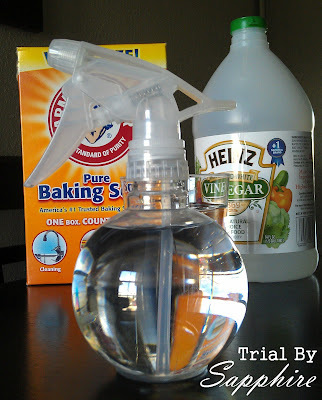 Mix ingredients together, and pour into an empty (preferably recycled and relabeled) spray bottle. Attack stains, spills, and other dirty stuff! Tip #1: To avoid spillage from the baking soda/vinegar reaction, start with the water, and then add the baking soda and vinegar. Tip #2: For heavy duty cleaning, use undiluted white vinegar. 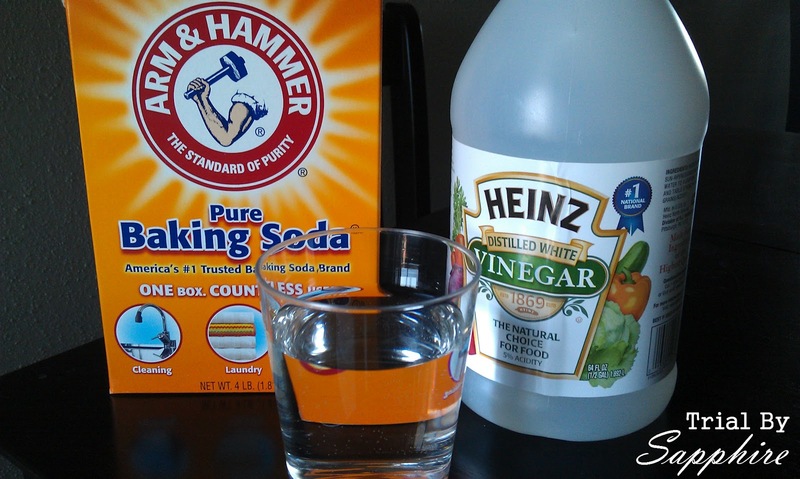 Tip #3: As the solution dries, the vinegar smell disappears. I promise! Easy, right? Here is the little bottle we keep on our kitchen counter. So I dare you. Ditch those expensive, chemical-laden store-bought cleaners, and save yourself some money! I triple dog dare you. great tip! can't wait to try this! The first thing that came to my mind was the bad smell of vinegar...haha! Glad that it goes away once it's dry. I might be tempted to add some lemon juice to the mixture. Any idea if that would be okay? I will have to try this out. I love the fact that it doesn't have any harsh chemicals. I usually try to buy "green" all purpose cleaner but this will be great to try and probably a lot cheaper. Thanks for sharing!! Thanks so much for your comment on my blog. It made my day. And I'm so happy to have found your blog - it's been great fun looking through your posts! Drainage ditches are a method of controlling runoff from streets and highways where curbs and storm drains are not used. They are most often a shallow trough dug in the ground beside and parallel to the road surface. They collect runoff from the road and direct it either to a retention pond or a natural body of water.